Abutilon palmeri (Indian Mallow) is a popular desert garden plant that is common in Arizona and northern Mexico. However, it is rare in the wild in Anza-Borrego Desert. The first specimen collected in our area was by Charles Harbison in April 1939. Two years later Frank Gander collected another one in the same general area. Gander’s description of the location was "near base of hills south of Vallecito Stage Station".His description generally applies to the valley known as the Potrero, a huge area with many hills. With such little guidance, it’s not surprising that there were no more confirmed collections or reports of the plant for 78 years, despite many people looking for it. There are many photos of it on Calphotos, but most are from cultivated plants, and none of the wild ones are from Anza- Borrego. James Lightner even removed the plant from the 3rd edition of his book because he believed it no longer existed in San Diego County. During the last week of March, amateur botanist Walt Fidler had been camping and exploring the Potrero area. On March 26, he found the long lost population of Abutilon, as well as a major population of Horsfodia alata (pink velvet mallow). He counted well over 100 individualAbutilon plants and estimated thousands of H. alata. To say that this was a major botanical find is an understatement. where the plant is found. What is special about this spot? It may be the large boulders, or the orientation of the slope, or something else that isn’t obvious. In any case, these plants eluded detection for a very long time. There may yet be other locations for the species, and a number of determined people have been looking hard. Fred Melgert and Carla Hoegen are looking at other potential sites. Walt himself has covered a lot of this terrain, but there are many parts that have not been thoroughly explored by anyone. 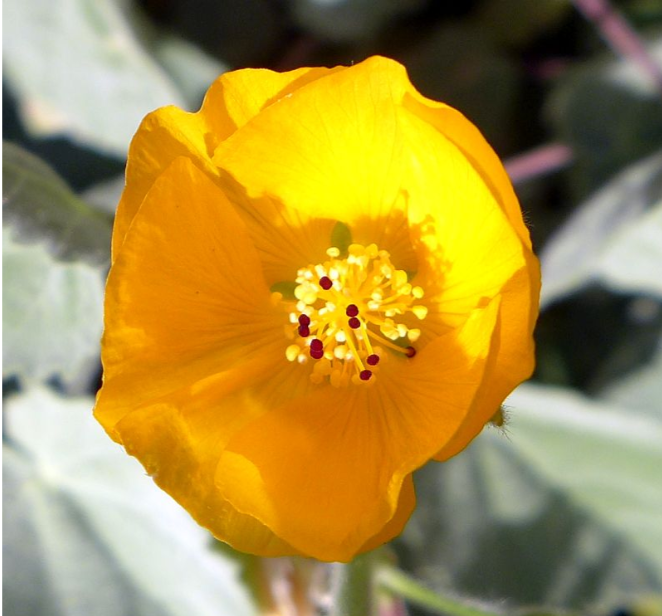 Horsfordia alata, another member of the MALVACEAE, is slightly more common than Abutilonbut still a rare species according to the California Native Plant Society. It was not collected in San Diego county until 2006 by Jon Rebman, in a different part of the Potrero. It tends to be more erect in habit than Abutilon, and its flowers are pink, unlike the more common Horsfodia newberryi that has yellow flowers. Both Abutilon and Horsfordia have fairly large leaves covered with soft hairs that give the foliage a velvety feel. En route to Abutilon Hill, Fidler pointed out a small population of Penstemon clevelandii clevelandii. This desert transition species is not rare but uncommonly beautiful. To find it in full flower was a special treat. Similarly, Lupinus excubitus medius is found in the desert transition. L. excubitus is a fairly widespread species, extending up into the Sierras. Of its 4 varieties, medius is the most restricted, being limited to the mountain springs area, from the Mexican border at the San Diego/Imperial County line, to the McCain Valley, with just a few outposts to the north, including Pinyon Mountain Rd. The species described here are only four of the many wonderful flowering plants seen this day. Although it was a 10 mile round trip with the last couple of miles requiring headlamps, the opportunity to see these four species in flower was definitely worth the effort. Don thanked all officers and Steering Committee Members for their commitment to the Botany Society. The Botany Society is set to have another productive season going forward. Major goals of the ABDSP Botany Society are “to promote greater education of volunteers and...to interpret Anza-Borrego’s unique plant resources to the public.” To accomplish these goals, Botany Society volunteers must learn plant morphology, plant ecology and the characteristics of the plant families comprising the diverse plant communities that exist in our Park. Its members and instructors have taken this task seriously. As for all of our Park societies, there is a Botany Certification Course held almost every season (missing only once in 10 years). The initial course was taught by CDD botanist Kim Marsden, followed by field expert Larry Hendrickson and then by educator Judy Ramirez. After Judy retired four years ago, the course has been taught by Botany Society volunteers. New and not-so new volunteers enroll in a 12-week long course held day-long every Monday, January through March. The goal is to learn enough plant morphology and ecology to be able to study the characteristics of twelve common plant families found in our desert. For plant morphology, San Diego State University Professor Mike Simpson’s excellent book Plant Systematics, Chapter 9 has been used. For the characteristics of the plant families, Sia and Emil Morhardt’s California Desert Flowers is used. The Morhardt book teaches each plant family using dichotomous keys (you know how that works: if this characteristic is present, go below to the next choice, if not, go to...etc.). Each chapter also has a useful section on similar families (or how not to get confused). The course is not all book learning and lectures. Almost every class has a field component and on occasion, the entire day is spent in the field—the theme of the course is “what do you see? What else do you see?” This year’s class is especially fortunate – as we actually have wild flowers blooming, making “seeing” easy and rewarding. Just as we expect our medical care providers to continue to learn and keep up to date, so too our volunteers must keep up to date with new plant discoveries and new information about plants learned, for example, from DNA analyses. We also need refresher lessons, and we want to learn about plants and plant families not covered in the Certification Course. To continue to learn, we formed the Botany Study Group six years ago. On Monday mornings in November, December and April (book ends of the January-March Certification Course), certified botany volunteers meet to select topics for study and then present the materials. To learn more about botany, we have taken advantage of online courses. We also use text books, monographs and all available resources to learn the new thinking about “what plants know,” to study specific plants and plant families not covered in the course, to study some plants and plant families in greater depth and to learn about paleobotany and ethnobotany. We have also learned about the early explorers of our region (and elsewhere) and the botanical discoveries that they made. We study certain plants in the field. Finally, we have guest lecturers on topics such as pollination and how palm trees are fertilized. Botany Study Group is fun! Over the past 10 years, Botany Society volunteers have devoted many hundreds of hours to this important task. Here are just a few of the ways we have done this. 􏰀For many years, Botany Society volunteers Mary Ekelund and Paul Larson have led Thursday Visitor Center field training trips all over the Park. Botany is a major part of this training. 􏰀Other Visitor Center volunteers who are also Botany Society volunteers, including Kathy Bussey, Arie Korporaal, Laura Webb, Terry Hunefeld and others, are able to discuss “where are the flowers?” with Park visitors, with a background in our botanical richness. 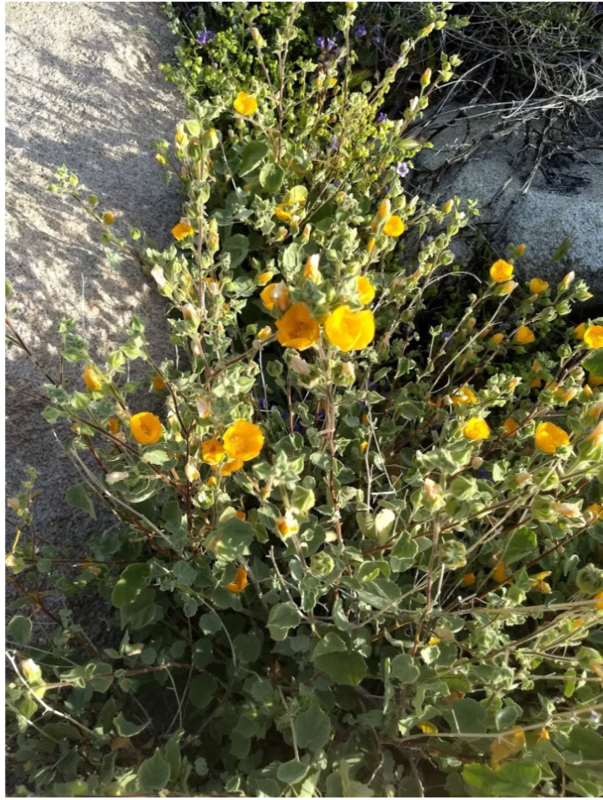 􏰀Botany Society has partnered with the Anza-Borrego Foundation to lead flower walks for up to 30 visitors each trip for many years. Among the many volunteers who have devoted countless hours to this are Mike Bigelow, Paul Larson, Karin Vickers, the late Mac McNair, Kate Harper and Don Rideout, to name just a few. 􏰀Many of our volunteers also assist other groups leading flower trips in our desert, including the San Diego Natural History Museum (the NAT). 􏰀 Finally, all the Botany Society volunteers educate our friends and relatives who visit us throughout the year about the rich botanical treasures in our Park. Happy 10th Anniversary, with wishes for many more years of botanizing! Don Rideout, current president of the Botany Society, will deliver a talk on Secrets of the Desert Lily at the next general meeting of the Anza-Borrego Botany Society, Monday, March 11, 2019 at 10 am. The location has been moved to the UCI Desert Research Station, 401 Tilting T Drive in Borrego Springs, due to the large number of visitors expected at the Visitor Center. The talk is free and open to the public. Don is a co-founder of the Botany Society, served as its first president, and chairs the annual plant sale in November. In addition, he is a certified naturalist who leads desert plant walks each spring. He has been studying desert lilies since 2001 and will share his unique photos, data and insights. Cost: Free lecture; public is invited. 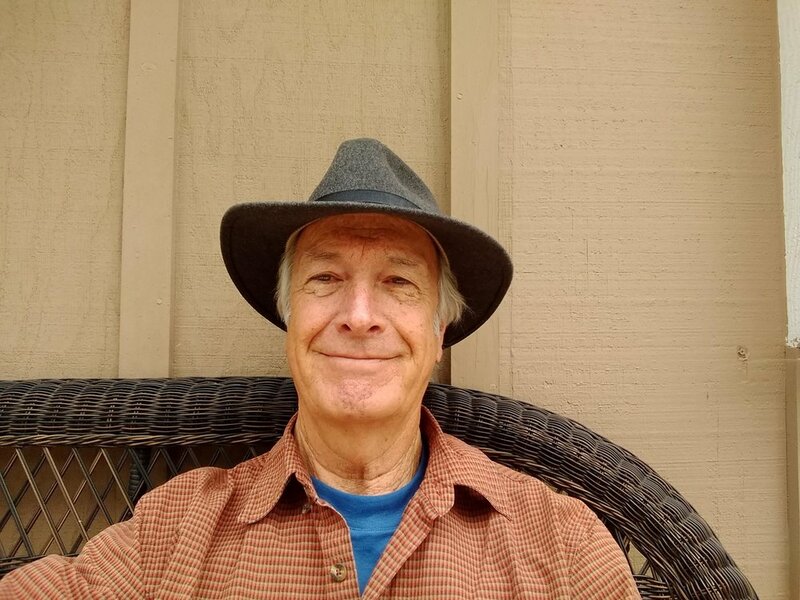 Tom Oberbauer, President of the San Diego Chapter of the California Native Plant Society, will be the February speaker as part of the Botany Society’s Public Lecture Series. He will discuss The 2017 Superbloom on Monday, February 11, 2019. Tom Oberbauer is a third generation San Diegan. He has had a life-long interest in natural resources of San Diego County and Baja California, particularly islands. He received his bachelor and master’s degrees in biology from San Diego State. Tom is fascinated by ephemeral natural phenomena such as wildflower displays and vernal pools. He has been observing spring wildflower displays in the Anza Borrego area since he was a child and has strong recollection of the good years in the late 1970’s, early 1980’s, and the mid 1990’s. The 2016-2017 rainfall season was above average for San Diego County, but not extraordinarily so, However, the timing of the rain and temperatures provided a unique situation for wildflower growth. The cover and diversity of wildflowers in the spring 2017, so-called superbloom, was equal to or greater than those of the majority of seasons in the past 30 years. Tom spent a number of days exploring the wildflowers and sheets of color across the landscape through the season as well as exploring the hills and Palm Canyon. Tom is happy to present his photographs of this outstanding wildflower season.